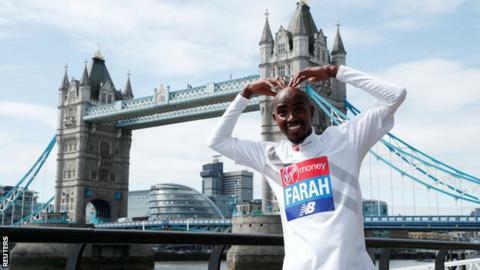 Four-time Olympic champion Mo Farah says he is enjoying not having the "pressure" of being the favourite for Sunday's London Marathon. Farah, 35, retired from the track last year in order to switch his focus to road running. He has not won a race over the marathon distance but is targeting a top-three finish in London. "It's going to be different, but every race I go into I aim to fight for a podium place," he said. "My aim is to stick to my own plan. The team at the London Marathon have put together an amazing field with guys like Eliud Kipchoge and Daniel Wanjiru." Kenyan Wanjiru won the 2017 London Marathon while compatriot Kipchoge is a two-time winner of the event, as well as taking marathon gold at the Rio 2016 Olympics. Farah last ran the London Marathon in 2014, when he finished eighth. "I've definitely prepared differently this year compared to 2014. When I ran the marathon in 2014 I had to think about saving energy for the track but this year I've gone hard at it," he said. "It's a great feeling not to have the same pressure as I do on the track. I'm just going to stick to my plan. If the guys set off at world-record pace, I'll go with them - why not?" Farah said he watched the 2018 Commonwealth Games on Australia's Gold Coast - at which he could have added to his medal collection in the 5,000m and 10,000m - but is standing by his decision to retire from the track. "I watched and I wondered whether I could have done that double," he said. "Maybe. But as an athlete you have to set yourself new challenges. You have to enjoy what you do."